The fund run by compensation expert Ken Feinberg said 91 percent of proposed awards were accepted by the victims. WASHINGTON (Reuters) -- General Motors' independent fund set up to compensate victims of accidents involving faulty ignition switches said it awarded $594.5 million and approved 399 death and injury claims. The payout was slightly less than the $600 million originally set aside for the fund's payouts, but GM's total costs related to the ignition switch defects now top $2 billion -- including a $900 million settlement with the U.S. Department of Justice in September, the fund said today in its final report before winding up operations. 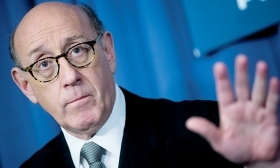 The fund run by compensation expert Ken Feinberg said 91 percent of proposed awards were accepted by the victims. That included all 124 death claims, and 16 of 18 serious injury claims. GM set up the fund in June 2014 under intense legal and political pressure for failing for nearly a decade to disclose ignition defects in older cars. The fund covered injury and death claims in 2.6 million cars recalled from 2003 through 2011. Neither GM nor Feinberg sought to reduce awards if victims bore partial responsibility, or if crashes occurred before GM emerged from bankruptcy restructuring in July 2009 as a new company. Seventy-four percent of approved death claims and 61 percent of all eligible claims had at least one issue involving unsafe behavior by the driver, such as not wearing a seat belt, speeding, drunk driving or falling asleep behind the wheel, the report said. GM was not legally required to pay nearly one-third, or 128 of the 399 claims approved, because they took place before the company's June 2009 bankruptcy, the report said. Only one victim has yet to decide whether to accept the compensation offer. Claimants who were not physically injured in this and other cases are appealing a U.S. court ruling upholding GM's bankruptcy shield. "We faced the ignition switch issue with integrity, dignity and clear determination to do the right thing both in the short and long term," GM spokesman Jim Cain said, adding that the fund "was fair, compassionate, generous and non-adversarial." Victims had to waive the right to pursue lawsuits or seek punitive damages against GM if they accepted a settlement. Bob Hilliard, a Texas lawyer who represents hundreds of ignition switch plaintiffs, said Feinberg and his team "did a yeoman's job. I thought they were fair." GM is far from done with litigation over the faulty ignition switches. Hundreds of personal injury and death lawsuits are pending in U.S. District Court in New York. A series of trials due to begin in January are expected to provide a template for possible settlements of remaining cases.